One of the most common questions I am asked is ‘how do you keep up with everything?’ For a writer, it all comes down to time management. While no one ever says it will be easy, I don’t know that anyone ever says it’s this much work either. I have no complaints as a writer, but I do wish I had more than 24 hours in a day. As much as I try my best to manage the time I have wisely, there is just never enough time in a day to get it all done. So, what’s a writer to do? Prioritize. It’s easier said than done and many days I feel bad for having to move an item from today’s to-do list to tomorrow, but that’s usually the case. A girl can only get so much done in one day, after all. So at the start of each day I run down my list of tasks, designate their order of importance, and get through as much as I can. Whatever is left over at the end of the day moves on to tomorrow’s list, and the cycle continues. For a writer, it’s not only about writing. That would be pure luxury. In reality, though, there is essentially a whole day’s worth of activities that has little to do with writing – directly at least. It all relates back in some way. A writer has to promote, market, and network in order to stay active in reader’s minds. That means social networks, media releases, bookstore events, and all of those things that involve other people. Then there’s the website updates, submissions to new publications, chats with editors and agents – all very important parts of the business. In order to sell a book, one has to be a sales person in some regard – whether to an agent or editor, or a magazine or store manager. These are necessary tools for success. How do I keep it all in order? I do. And I don’t. I will admit there is a certain amount of chaos that keeps me working like a frantic person, worried I will never get enough done in a day. In a way, that busy feeling is the adrenaline push I need to make sure I get maximum productivity in for the day. If I were to wake up one morning and only have two things to do, I’d definitely work at a slower pace… and come to think of it, that might actually be nice for a change… but I would likely drag a bit, procrastinate, take my time, and do all kinds of things instead (like watch tv, nap, read horoscopes, etc). Now, I am not saying I am a workhorse, but I think the more I work, the more I work. The more I write, the more I write. That may sound a little silly, but there’s actually some sense to that. If you keep adding fuel to the fire, the fire keeps on burning all through the night, right? What are some of the tricks I do to keep organized and under control? While it’s demanding to keep up with the social networks, I limit myself to one day a week for posting and responding to my various groups. Maybe that’s not as active as some people, but it keeps me in the loop without sucking up too much time. I clear my email inbox at least every other day; otherwise I’d be drowning in a backlog of replies-to-do. And as much as I am an advocate for attending real live literary events and readings, if I have already been out to three events in one week, I cut myself off so that I don’t spend an entire week away from my desk. The thing about prioritizing is setting limits, saying yes to some things, and – sadly – saying no to other things. Because at the end of the day, I still need to be able to say I did at least one thing – write. Yes, that other big part of being a writer. Making time to write. Even if it’s a 1,000 word portion of a chapter, even if it’s just a paragraph or a few key sentences, I have to have made time for writing. Or else… why bother with all the other stuff? It’s all too easy for a writer to get caught up in the promotional side or spend a large portion of time networking. These things are important, but only if the writing can back up all the hype. One poem or a paragraph a day will keep you focused and on track. It adds up quickly too. A paragraph here and there soon becomes a chapter. A few chapters later, there’s a book in progress. No, I have not mastered my time management skills, nor have I figured it all out. I am my own work-in-progress. But I try. I have a silly little to-do list to keep me in check and I strive for balance and aim to have fun in life outside of my working hours. Do I wish I had more time to work each day? Yes, but I also won’t compromise what little sleep I get or the time spent with friends and family. So I do what I can and hope for the best. What about you? How do you balance your time? Do you make time for play? 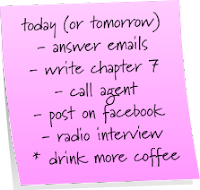 Do you keep a to-do list or prioritize some tasks over others? I’m curious what works for you and what is a challenge. I hope you’ll share your own plan of attack. It’s always interesting to hear tips from others. Speaking of tips from writers, there’s a specially scheduled author Q&A on Tuesday, this week, with author Allison Winn Scotch. She’ll be chatting about her novel Time of My Life and share a few tips for emerging writers, her own path to publication, and lots more. So be sure to stop in for this extra Q&A for the week, in addition to the Wednesday feature. You won’t want to miss it! It sounds like you've got an effective plan. I'm still looking for my sticky notes and a pen. Not very organized yet. Hi C. Lee... great website! If nothing else, your promotional side seems very organized! And you know, there is no such thing as being totally caught up if you're a writer. If you're all caught up, you're not doing enough for your writing. Right? Good luck with getting organized and thanks for dropping in! Yesterday, while you were writing this post, a friend and I were having this same conversation. About the necessity for the social networking but the need to limit that time in the interest of "the real thing," which is, of course, the writing. After talking, we each made lists of the things we wanted to accomplish in the upcoming months. Then we made daily, less-than-daily-but-more-than-weekly, and weekly lists. Finally we talked about how we wanted our days to go--what shape the mornings, afternoons, and evenings would take. A productive exercise to do periodically so we run our days instead of our days running us. Summer is a good time for this as we all gear up for the fall. Thanks for the timely post. Cynthia, thanks for chiming in. I love what you and your friend did. I do the same thing in that I look at all the need-to-dos and want-to-dos and basically outline a plan of attack (I don’t like to call it a schedule or routine as it sounds so formal and oppressive for a writer) of what I can realistically accomplish and when. It’s not always necessary to cut things out, but it comes back to ‘everything in moderation’ so the – as you say – real work gets done. You and your writing friend sound like you have a great system – and a really nice support network in one another. Great job! I’m so glad you popped in and commented. Thanks! great post. Thanks. I think about time management every day. But I rarely do the actual managing of the time. It's a hard moment when you realize "done" doesn't exist in the overall sense...only task by task (bird by bird?). But reading the reminder about prioritizing is helpful. Sometimes a long-distance friend of mine, we'll e-mail and tell each other the things we want to get done in the next hour--print out stuff for submission, write, clean the living room, whatever--and then we check in when the hour's up and see where we are... very helpful to have a partner in that. I like the tag-team system you have going. It is very helpful to have someone like that as a partner. I third the notion that Bird By Bird is great! It's the how to book that has stuck with me the most in terms of how I write (and I'm not even a novelist). The trick I use the most from the book is the picture frame idea: you work every day, but you only have come up with something that fill the frame, be it a blog post or a character description, or answering emails. Depending on the size of the frame, this could be a lot or a little. That's a great trick to remember, Lindsay. Plus, I like the gravy.... when it's there. I *love* Bird by Bird. Another fave of mine is On Writing by Stephen King. I find with those two books, you can read them over and over again and always find some new form of inspiration in there.